Through Episodic 86, TOBY provided a highly energised opening. With abounding strength and power, the female performers present us with an intricate exploration of the recollection of memory. The work paced through a seemingly endless stream of fragmented gestures examining personal experience, augmented by a driving electronic sound score by live artist Benjamin Winter. The continuous, unrelenting rate of this piece made it difficult for these personal images to resonate with me, and I yearned to see a singular idea explored more deeply. A promising offering and certainly an impressive movement vocabulary from choreographer Katy Higgins. Barnaby Booth’s Loyal Prophets to an indifferent God is a beautifully bleak performance that from the outset transforms the stage into a vast landscape, in which the ensemble of dancers stumble and flail. Opening with words from Robert Musil, a philosophical contemplation of religion is approached with maturity, and Booth’sexperience as a lighting designer truly enhances the disoriented vulnerability of his performers. A light brought forwards into the space creates an uncomfortable glare as a male body has to be forcibly restrained as he violently twists and flounders. The near faultless cohesion of the dancers and some notable contact work made this one of the festival’s strongest pieces so far. 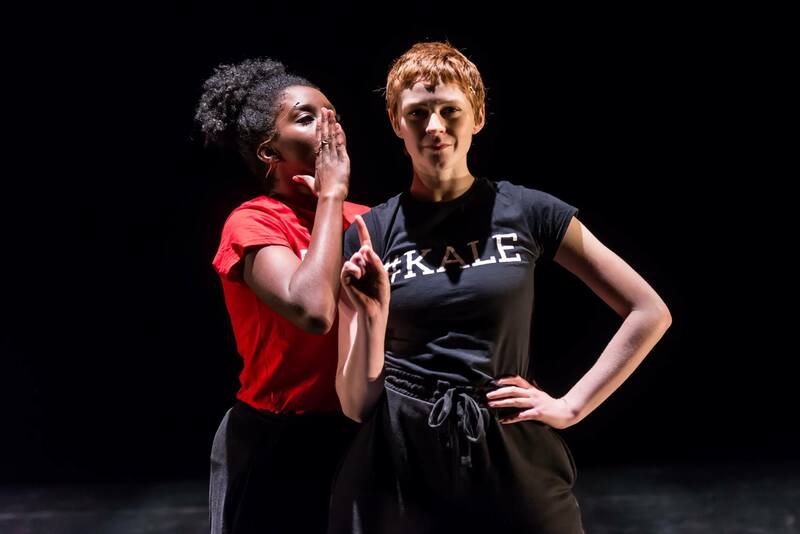 The final offering from Ella&co is a bold and thoroughly engaging new work that pokes fun at the millennial generation and its self-obsessed culture. The individual personalities of four likeable, quirky women made #nofilter lighthearted and enjoyable without lecturing us. Like an Instagram filter we are exhaustively subjected to vigorous, sometimes aggressive pouting, posing and preening. An interlude, where the dancers awkwardly shuffle, nonsensically gabbling at one another reminiscent of the EA Games SIMS franchise was particularly popular with the evening’s young audience, whose enthusiastic laughter demonstrated the piece certainly connected with the demographic that provided its inspiration. Reviewed by Daisy Moorcroft at The Place, Resolution Festival on 13 January 2018.